Sugarloaf's Fundraiser a Great Success! Sugarloaf’s February 4 fundraiser, featuring the west coast duo PEAR, was a rousing success and tons of fun. 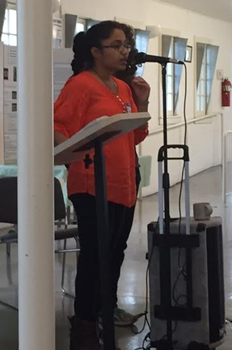 About 170 attendees partook of a catered dinner and enjoyed the eclectic hour-long set of old and new musical favorites, as well as some original songs from the acclaimed group. The event raised just under $7,000, a substantial addition to SCA’s coffers. The money will help pay for our advocacy and activities to protect the Ag Reserve and preserve a rural way of life in our community. The event’s success has sparked conversation about making a winter fundraiser, with music, an annual tradition. Let us know what you think about that idea. Congratulations to Anne & Jay Cinque! 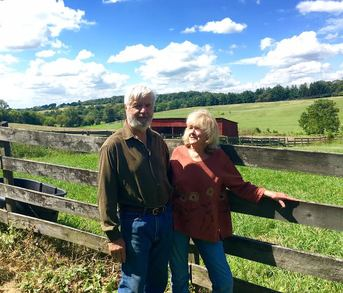 Montgomery Countryside Alliance on October 23 presented the 2016 Royce Hanson Award to Anne and Jay Cinque in recognition of outstanding commitment to the protection of Montgomery County’s Agricultural Reserve. The annual award is named after its first recipient, Dr. Royce Hanson, former Chair of the Montgomery County Planning Commission and original architect of the Ag Reserve. Anne and Jay are long-time SCA members and champions. Jay served as SCA president from 1983 to 1987. Both Anne and Jay are SCA board members now. Anne and Jay moved to Boyds in the fall of 1973 with their two young sons, Bryn and Cory, who were 3 and 1 at the time. As an early introduction to the importance of citizen activism, shortly after their arrival in Boyds, they were notified that Potomac Edison proposed to run a double pole transmission line from Clarksburg to Beallsville across their backyard - to “improve the grid." Their community involvement and testimony at many hearings before the Public Service Commission forced the line to be rerouted. That initial involvement propelled both Jay and Anne into community activism. Jay served as President of the Boyds Civic Associationfrom 1975 to 1980) and, as mentioned above, as SCA president from 1983 to 1987. For the past five years Jay has also served as the treasurer of the Sugarloaf Land Conservancy. The conservancy helps private land owners put their property into conservation trusts. Jay and Anne also have been heavily involved for years in preserving Little Seneca Reservoir. Most recently, they launched Friends of Ten Mile Creek and Little Seneca Reservoir. The group works to prevent development along Ten Mile Creek and the Little Seneca Reservoir. 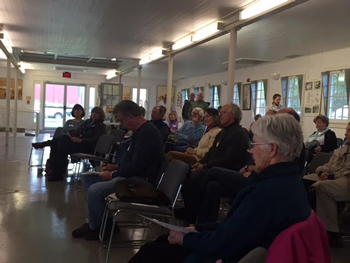 Sugarloaf's 44th annual meeting on April 30 reminded those gathered of the need to be "ever vigilant" - in the words of President Beth Daly - against threats to the Ag Reserve from developers and others who would whittle away at the Reserve's purpose: to preserve and nurture agricultural land use and a rural culture in a 93,000 acre portion of northern Montgomery County - almost one third of the county. Daly also reminded SCA members and friends of the persistent need to educate Montgomery County residents about the Ag Reserve and the benefits it confers for all who live in the county. • Oppose construction of a second Potomac River bridge that would vastly alter traffic volume and patterns in the Ag Reserve and fail to ease traffic congestion in the county as a whole. • Support the Ten Mile Creek Coalition in its battle to convince the WSSC to install environmentally friendly sewer technology in the sensitive Clarksburg watershed area. • Oppose the Global Mission mega-church proposed for development off Route 109. Legal battles to block the Silver Spring-based church have been ongoing for several years; SCA has been actively involved in that litigation. • Expand high-speed broadband access in rural areas in the Ag Reserve, to help farmers, home-based businesses, students and residents. • Foster local farming, gardening and land management in the Ag Reserve and at Sugarloaf's own Linden Farm. Sugarloaf holds gardening seminars and an annual spring plant swap, and has recently created an apiary at the farm. Daly reminded attendees that none of Sugarloaf's work would be possible without support from members. As she wrote in her 2015 end-of- the-year note: "From its inception, Sugarloaf has been an all-volunteer organization... But land use attorneys, environmental experts, and communication tools to mobilize and support supporters cost money. And we would not have realized the successes of the past year without investing in that expertise." If you are not a member please consider joining us to help preserve and protect the Ag Reserve. Membership is $20 per individual and $40 for a family. Click on the button above to find out how to donate. 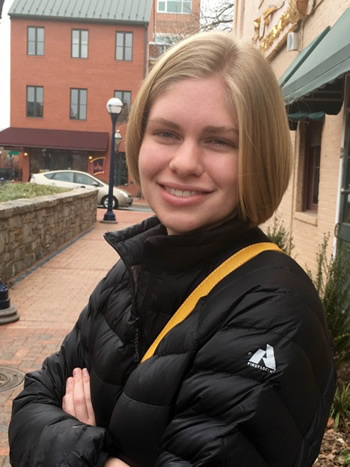 Poolesville High School student Clara Jackson, a junior next year, is the winner of Sugarloaf's 2nd annual essay contest, which carries a $300 cash prize. Finalists were Kavon Badie, Jen Dunn, and Ankit Sheth. Sugarloaf President Beth Daly, one of the contest's judges, said, "The choice was tough. Many of the essays were very thoughtful and creative. We thank and applaud the students at PHS for participating and look forward to next year's contest." "Welcome to your new world. The land surrounding you is prime Maryland agricultural land. You will live here for 3 years. You are responsible for managing the farm. You'll find $100,000 in a checking account in your name to get you started. Have fun!" A fantasy, of course. But can you imagine being a farmer? What would you do with the land? Would you plant crops like corn or soybeans, or perhaps raise cattle or sheep? Or start a horse farm and riding school? Or maybe you'd grow grapes to sell to wine makers. Or plant an orchard. We invite you to write a brief essay explaining what you would do with the farm and why, and how it would enhance the Ag Reserve. Here's the beginning of Clara's essay, with a link to the full text at the bottom. There are a wide variety of crops grown and livestock raised in the Montgomery County ("MoCo") Agricultural Reserve. Some of the most prominent crops grown include corn, soybeans, wheat and barley. If I had an opportunity to manage a farm in the Ag Reserve, I would try a different crop. While many would choose to grow the established crops, I believe that it would be beneficial to diversify the Ag Reserve by introducing a new crop - hops. This would offer my new farm a niche so that my farm wouldn't have to compete with older, more established farms. It would also help expand the economy of the Agricultural Reserve, because new crops attract new businesses and people. If I was given a farm in the Montgomery County Agricultural Reserve, I would grow organic hops (specifically Cascade, Golding, Nugget, Chinook, and Fuggle hops) to sell to the various craft breweries in the DC-Maryland - Virginia area.